In our series of letters from African journalists, Zeinab Mohammed Salih looks at what is behind the wave of protests in Sudan threatening President Omar al-Bashir's three-decade-long grip on power. Many in Sudan now prefer to keep their money under the mattress rather than in banks. If people put their savings in the bank it can be hard to get out as cash machines are often empty. Where cash is available, long queues have become the norm in the capital, Khartoum. There are also queues for bread. Coming back from work late at night, I have often had to wait an hour to get to the bakery window only to be told that there is nothing left. Other foods are becoming expensive for many people in the capital. Fava beans, or fuul, are considered a staple here which could be found at any corner shop. But the shop next to where I live has now stopped selling them because, the owner explained, most people could no longer afford them. Returning from a six-month stay in the US in September people were noticeably thinner. The problems stem from the government's attempts to prevent economic collapse with emergency austerity measures and a sharp currency devaluation. In December it cost 76 Sudanese pounds to buy $1 (£0.79) on the black market, whereas six months ago a dollar cost less than 40 Sudanese pounds. Prices are also rising. The annual inflation rate reached 68% in November compared to 25% a year earlier. As part of the austerity measures, the government has reduced subsidies on fuel and bread, leading to a rise in the cost of basic commodities. The increase in the bread price last month triggered a wave of mass protests, which are still going on. 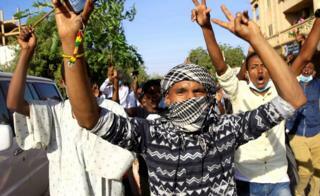 They started in the eastern city of Atbara on 19 December when the headquarters of the governing National Congress Party (NCP) were torched. These have morphed into demonstrations calling for the end of President Omar al-Bashir's nearly three-decade rule. Protesters, adopting a slogan of the Arab Spring, have been heard shouting: "The people want the fall of the regime." The demonstrations in Khartoum are the largest against President Bashir since he came to power in 1989 in an Islamist-backed military coup. And things have turned deadly. Officials say 19 people have died after security forces tried to quell the protests, but rights group Amnesty International has said it has credible reports that 37 protesters were killed. Many opposition supporters have been arrested and journalists have been detained and harassed after covering the demonstrations. This has all increased the pressure on the 75-year-old president, who people said appeared tired and a bit confused when he was addressing top police officers a week ago. He urged them to use less force against the protesters but then appeared to contradict himself by saying rather mysteriously: "What is exacting penance? It is killing, it is execution, but God described it as life because it is a deterrence to others so we can maintain security." This was interpreted by some as a green light for a more brutal approach. The next day, thousands marched in downtown Khartoum, three people were shot in the head and one doctor was shot in his thigh by snipers, activists say. For its part, the government has accused some people from the western region of Darfur as being behind the protests and carrying out acts of sabotage and vandalism. A group of young Darfuris students of non-Arab descent were arrested and it was alleged they were being trained by the Israeli secret service to sabotage the state. Their friends have denied this and have accused the government of using them as scapegoats. In solidarity with students, the protesters have added a new chant during their demonstrations, shouting, "You arrogant racists, we are all Darfuris." President Bashir has promised a pay rise for civil servants in an effort to ease the problems, but this is unlikely to tackle the underlying causes. On Wednesday, he held up Syria as a warning while addressing a crowd of his supporters in Khartoum, saying instability could make them refugees. But the country has been struggling economically for several years, and the problems were exacerbated with the secession in 2011 of South Sudan, which had three quarters of the country's oil production. It has also been isolated internationally and even though some US sanctions, imposed for alleged links to terrorism and human rights abuses, were lifted in 2017, things have not improved. Attempts by the president to find new allies, through visiting the embattled Syrian president and sending troops to support Saudi Arabia, do not appear to have paid off. Meanwhile, despite the queues for bread and cash continuing, the atmosphere in Khartoum has changed since the beginning of the demonstrations. There is a sense of fear. Some women say they have stopped going out because they do not want their children to leave the house and join the protests as happened during anti-government demonstrations five years ago. But there is also courage. People can be heard shouting at the armed officers looking down on them from the roofs of buildings: "Snipers, we can see you!"